Immaculate and updated custom home nestled on a large lot in a quiet private cul-de-sac this 4050 sq foot is a wonderful family home, & rare find in Tanoan gated community. 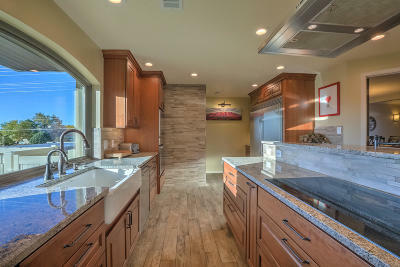 Top of the line gourmet kitchen with exquisite cabinetry is every chefs dream. Enormous island with top of the line Bosch Appliances. stainless steel . Commercial refrigerator. Renewal by Anderson Windows. Media Room with Surround Sound with Blackout shades in Family room. Generous sized bedrooms and separation of space. Master suite offers a sitting area & an office office complete with cozy fireplace. Stunning sparkling baths with 3 walk in showers and a custom tub! Enjoy the Balloon Fiesta & gorgeous sunsets from the Balcony. Patio is perfect for entertaining & Mountain Views! Priced to Sell! Don't Miss this one!